Need to see which 2nd page keywords moved to Top 5? How about 2nd page keywords with than 5,000 monthly searches that moved to Top 5? The new advanced filters in AWR help you get actionable insights by refining your keywords to the exact conditions you need. They are available on the Ranking and Comparison menus, on the Keywords, Websites and Search Engines views. The filters help you refine data from three different sources: Rankings, AdWords and Search Console. Previous Position - filter by a position range for the previous date of the comparison interval. Note: the optional filtering criteria are available only for the optional columns that are added to display, from the column selector. The relation between multiple conditions is AND. This means that the information listed on the report table after you apply a filter will meet all the conditions together. Filters are available across all projects. They can be further selected, or deleted from the filter manager. Note: saved filters that refine data available in multiple views can be selected in each of these views. 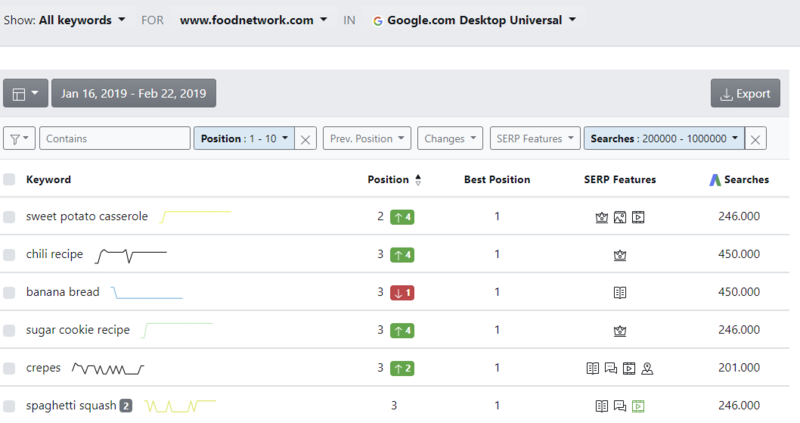 For example, a filter with Position and Changes criteria is available in Ranking Keywords and Websites, as well as Comparison Search engines and Websites. Here are some of the use cases that we hope you’ll find helpful. With this filter, you can easily find which brand terms and / or product terms changed positions during a specific time frame. 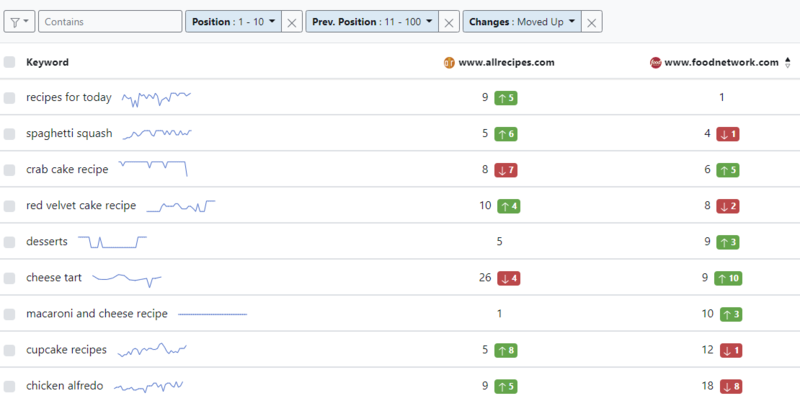 This filter helps you find the high search volume keywords for which a competitor started to rank on the first page. 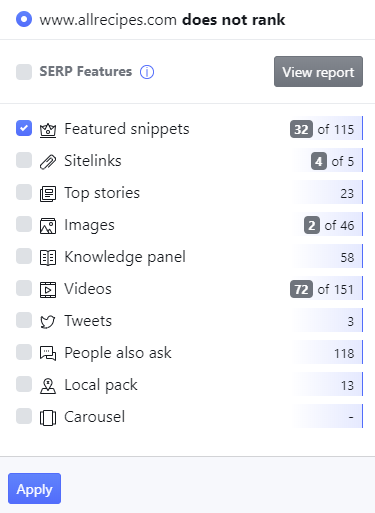 Or, you can find for which of your top 10 keywords the Featured Snippet belongs to the competition. Note: for this scenario, the SERP Features filtering criterion is defined as website does not rank with Featured Snippet. 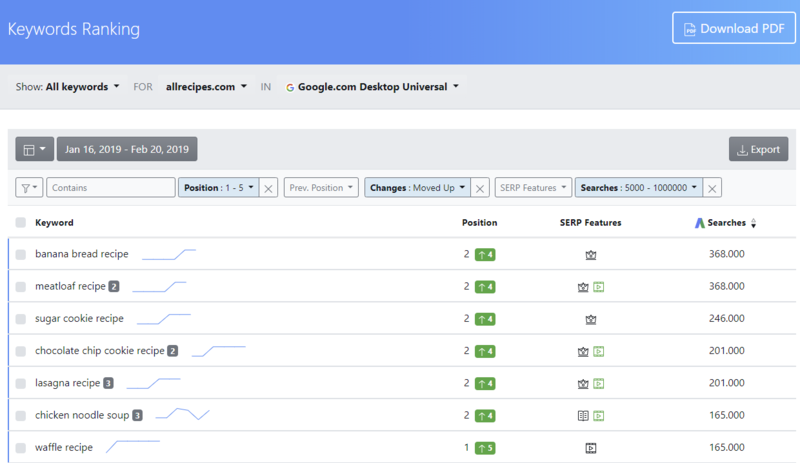 This filter is helpful when you need to find the keywords that have a high number of impressions and a high search volume, and you rank on positions 5-10. This filter can be applied on the Comparison - Search Engines view, showing the list of keywords that meet the filtering criteria for any of the markets on display. 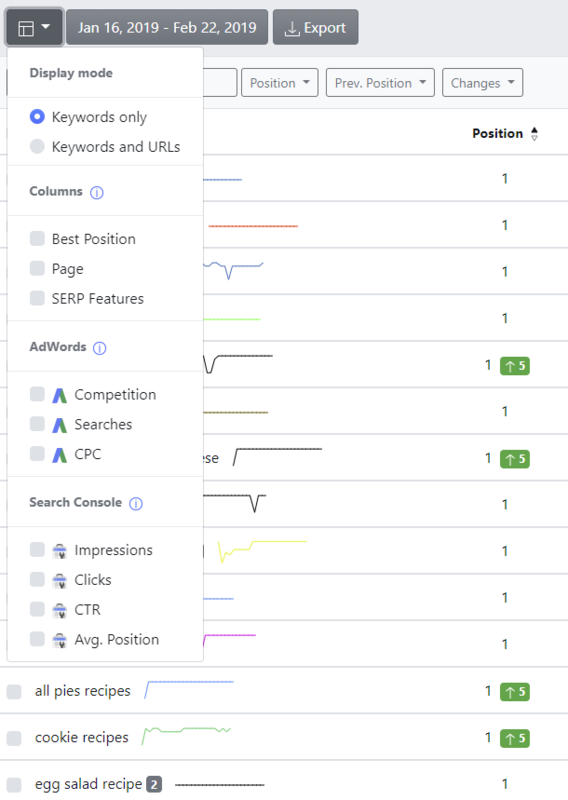 With this filter, you can easily discover the keywords that your competitors are optimizing for, from the keyword set that you are tracking, and see how you performed for those specific terms.